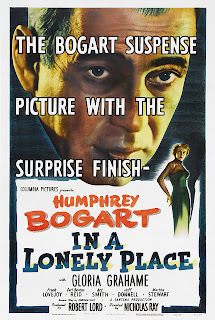 In a Lonely Place is a coincident film within the careers of Humphrey Bogart (Casablanca), Gloria Grahame (The Bad and the Beautiful), and director Nicholas Ray (Rebel Without a Cause). Despite being an adaptation of a novel by Dorothy B. Hughes, it is the most personal film for each of the trio. For Bogart, the character of alcoholic screenwriter Dixon Steele reveals the real-life vulnerability and mercurial temper that afflicted the actor. In Graham's case, the film highlights some of her insecurities vis-a-vis her marriage to Ray. And as regards Ray, it parallels the slow disintegration of his relationship with Grahame while giving us a glimpse into his early days in Hollywood. This may explain the atypical unspooling of what is classified by many as a film noir. And it is one, in the sense that its protagonist, lonely screenwriter Dixon Steele, is an antihero with a self-defeating flaw, an uncontrollable temper; Burnett Guffey's expressionistic cinematography denotes the shadowy, claustrophobic world Steele finds himself in as the police circle about him, questioning whether he murdered a hatcheck girl last seen leaving his apartment; a blunt-speaking platinum blonde, struggling actress Laurel Gray, dwells in the same complex as Steele and provides him his alibi, informing the cops of the timing of the murdered girl's early exit from Steele's abode and his decision to remain. The crucial point at which this typical-sounding noir turns is about forty minutes in. Frances: Do you look down on all women or just the ones you know? Dix: I was pretty nice to you. Frances: No, not to me. But you were pretty nice. Ray is even canny enough to place us squarely in Dix's head for a few p.o.v. shots in his apartment, as Mildred, the girl to be found dead later, synopsizes a story the writer plans to adapt for his next movie looking straight into the camera, the viewer as Dix. His initial plan to seduce the naive, starry-eyed girl in his flat literally dissolves in our own mind as we become privy to the way he now views her: shrill, grating, and unworldly. We've met Grahame's Laurel already as Dix walked into their shared courtyard with young Mildred, and now we see her again, through his window, standing on the balcony overlooking his apartment as he escorts Mildred out. Cut to morning when Dix is woken up by his old friend, Detective Brub Nicolai (Frank Lovejoy) and taken downtown for questioning. The point is we see what Dix sees, with rare exception. When he sleeps, the film just skips forward. But that move forward elides past the crucial moment in question when Steele may have murdered poor Mildred. Luckily, Steele remembers Laurel on her balcony, and the cops bring her downtown to backup his alibi. This meeting sparks a mutual romantic interest between the two, and after some trepidation on the part of Laurel, a full-blown relationship. It is here that, as Danny Peary states in his Guide for the Film Fanatic, "an interesting thing happens: Grahame becomes the main character." Now, we are with Laurel when she is called back to the police station for a follow-up interview. We are with her when a masseuse warns her that Steele used to beat up another woman she used to work on, the one we saw earlier at Paul's, Frances. We are with her at a beach party with Nicolai and his wife, when Steele flies into a rage after discovering the cops called Laurel down to the station again and he takes off in his car, almost leaving her behind. It is from her point-of-view in the car that we see Steele beat a young man nearly to death after he cuts Steele off in traffic and calls him a "blind, knuckleheaded squirrel." As Laurel becomes more and more confused whether Steele is capable of having murdered Mildred, Ray spends less and less time with Dix. Life on the set was obviously fraught with emotional hazards. Ray had modeled the movie's apartment complex on an apartment he once occupied at Villa Primavera in West Hollywood. When he moved out on Grahame, I learn from critic J. Hoberman, Ray actually moved onto the set and started sleeping there. Love or lust often motivates action in noir, particularly via a femme fatale (as in Double Indemnity or Out of the Past). But it also holds up a mirror to myriad themes, largely existential, that hang over characters with profound malaise. Ray approaches the torments of Camus and Sartre with In a Lonely Place (1950) showing, not only the delicacy of true love, but the delicacy of creativity, violence, trust, and a person's own position in an often ugly, alienating world and the inner nausea it creates. Perhaps the depth of resentment stirred up by the film's depiction of a love gone wrong had some influence on the demise of Ray and Grahame's marriage, which ended on a rather lurid note. Dix and Laurel are finally undone by a near fatal flare-up of his rage just as he's found innocent of the murder. 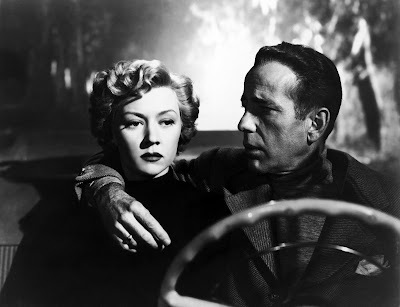 But make no mistake, despite the tragedy of doomed romance that looms over much of the movie, especially in Laurel's half of the film, In a Lonely Place's twisted web of mistrust, violence, and sexuality place it firmly within the noir tradition. Of Nicholas Ray's films, I'd only previously seen Rebel Without a Cause in a semester of American History of the '50s and '60s I took in high school. But when I watched In a Lonely Place a few months ago I was completely stunned. It boasts certainly the finest of the Humphrey Bogart performances I've seen, and even though Ray is more noted for his color films I found his compositions mesmerizing and the relation of the behind-the-scenes goings-on to the narrative content fascinating. Because of In a Lonely Place I placed a blind pre-order of the new Criterion Blu of Bigger Than Life. I cannot wait to watch it this week. Yeah, I have a preview copy of the BIGGER THAN LIFE blu for me to watch this weekend. Its arrival in the mail prompted me to go back and watch some of Ray's other flicks which I had handy. So there will be an unofficial blog-a-thon here for the next few days. Fantastic review on a film I love. I also loved the moment when Dix realizes that he can't stand the soon to be murdered girl and that any chance he had to seduce her is gone. Bogart plays the sleazy good-guy second-to-none. That is a great point you make (via Peary) about our POV shifting from Dix to Laurel half-way in. I didn't even realize that while watching the first time. It's also at that point that you actually start believing, even if it's just a bit, that perhaps he did commit the murder. Not many actors of that era would allow us to believe that to be true, but Bogart could and did. Ray's demons seem to be in full view in those rage/depression scenes, filtered brilliantly by Bogart. And yet what I love about the film is that despite him being proven innocent, Dix isn't absolved of all his "crimes" in the end. He may not be a murderer, but his rage ruins any chance he has for happiness with Laurel. It's the perfect downbeat ending to the film and really caught me by surprise, but plays entirely fair with the characters (and as you point out, hews closely to Ray's own life and eerily to his relationship with Grahame). Obviously, lots to dissect in this film. Again, great job here -- a very enjoyable read. Yeah, great ending. Originally, it was shot with Bogey actually killing Grahame, and his cop friend arriving too late with the news that he was absolved of the other crime. What a kicker that one would have been. But Ray was perceptive enough, in my opinion, to realize the original ending was a bit too pat. Rather than go for what was at the time the easy, downbeat ending where the noir protagonist is undone by his fatal flaw, he goes for a bitter, realistic, and complex ending in which both characters, still in love, decide they must go their separate ways. Brilliant.